America’s best finance companies have their eyes on Shivam Patel. Patel served as an intern with Goldman Sachs in New York City, where he processed data access reports for the investment banking firm and worked on projects for its Controller’s Technology Office. Patel was invited back for a second internship the following year. His second summer there, Patel interned at Goldman Sachs’ FICC Product Control Division, where he calculated profit and loss statements for traders, consolidated reports for executive managers, calculated daily balance sheet reports for the credit flow desk, and updated a compliance manual. 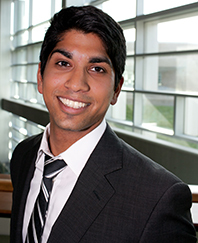 Though he was offered full-time employment with Goldman Sachs at the conclusion of the internship, Patel recently accepted an offer to participate in Raymond James Financial’s OPTIONS program. The competitive, year-long experience gives top-performing grads a chance to work in a range of business areas while working closely with Raymond James senior management and taking targeted finance courses through Raymond James University. With a 3.94 grade point average, his name has appeared on the dean’s list every semester. Patel has earned these exceptional grades as a part of the Business Honors Program, which requires students take rigorous courses, work alongside faculty on a research project, and study abroad. Patel spent a semester abroad as an exchange student with Hogeschool Holland Haarlem in the Netherlands. Beyond academics, Patel is involved in the Corporate Mentor Program, the International Business Board, and Noble Guides. It is great to have Patel in your financial management company because these types of professional always deliver the best and we all need to have young energetic professionals that can provide the best advices to the inverters and to solve their investment flaws and problems.